Your spine is responsible for a number of important functions, including carrying messages from your brain to the rest of your body. At Northwest Spine Center in The Woodlands, Texas, J. Michael Graham, Ph.D., M.D., specializes in diagnosing and managing acute and chronic spine injuries. He offers several treatments including medications, physical therapy, and sometimes spinal injections, to alleviate pain quickly. Dr. Graham can also perform minimally invasive surgery to give you long-term relief of chronic spine pain. Find out more about treating spine injuries by calling the office today, or book an appointment online. What are common spine injuries? Your spine contains 26 vertebrae that provide stability and functionality to your body. The versatility of your spine allows you to move in a variety of ways, such as standing and sitting. While the spinal column is designed to be strong and flexible, it’s susceptible to injury and disease that breaks down the vertebrae. Degenerative diseases, like arthritis and osteoporosis, can also affect the health and stability of your spine. As vertebrae wear down and the protective discs between each vertebra degenerate, you can experience persistent pain and mobility issues. In some cases, damaged vertebrae can lead to compression of the nerves in the spinal canal that eventually causes permanent nerve damage. How are spine injuries diagnosed? Electromyography is also an effective diagnostic test which evaluates the health of your muscles and the nerves which control them. The test uses small electrodes that collect data about the signals your nerves give out. This test can help identify disorders of the spinal nerves or compression problems from a herniated disc. Once he determines the cause of your symptoms, Dr. Graham creates a custom treatment plan designed to provide long-term pain relief and increased functionality. 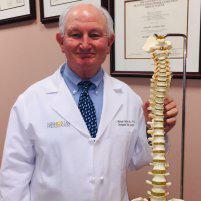 What treatments are available for spine injuries? The treatment plan Dr. Graham uses is based on the severity of your injury. For emergency situations that affect your spinal cord, such as auto accidents or falls, you may need surgery to prevent additional complications, including paralysis. If you have spine damage from a degenerative disease, Dr. Graham may recommend physical therapy, medications, or steroid injections to reduce your pain and increase your mobility. When nonsurgical therapies aren’t enough to improve your quality of life, Dr. Graham may recommend surgery. He offers traditional and minimally invasive surgical methods that can correct structural issues in your spine or repair damaged discs that cause pain. Dr. Graham can also recommend physical therapy exercises following surgery to help you regain functionality in your spine. Don’t delay treatment for a spinal injury. You can schedule a consultation online or by calling the office today.